You might have noticed I’ve been rather quiet of late which, if you know me, is out of character. Life has been busy. 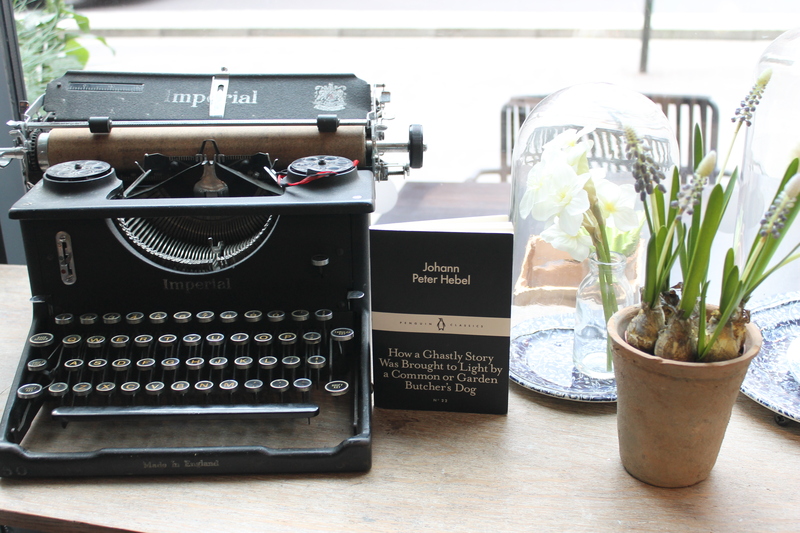 Having returned from Plymouth, as discussed in the last blog post, I nipped home for a couple of weekends and spent an idyllic few days in Paris, nibbling on crêpes and winding around the stocked shelves of Shakespeare and Company. Utter bliss. A Little Bit Bookish took a bit of a backseat. But here I am, at last, in the fine company of a Penguin. My friend Emma chose this week’s Classic – How a Ghastly Story Was Brought to Light by a Common or Garden Butcher’s Dog, which I am shortening to A Ghastly Story from hereon. 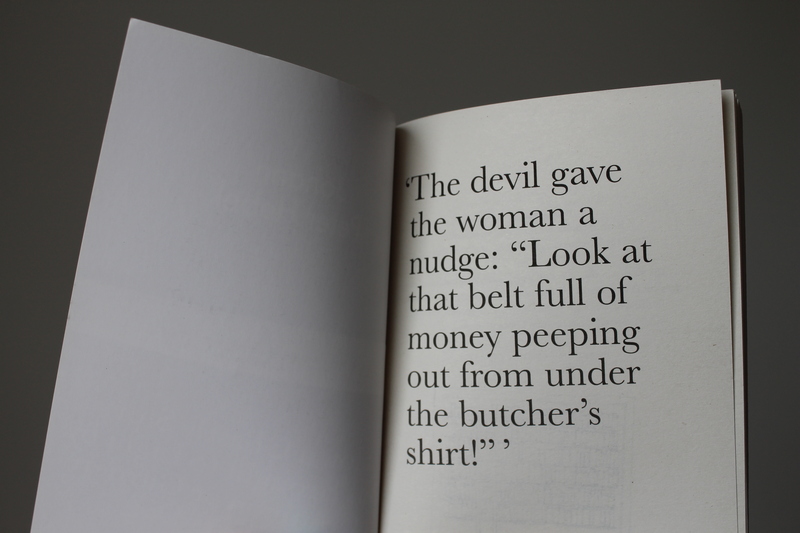 A collection of fables, translated from German, these short stories offer moral warnings and advisories for adults, highlighting the perils of stealing, arguing, arrogance, trickery and trusting vagrant salesmen. They make for a very different and varied reading experience. They’re classic German Gothic – castles, ghostly apparitions, murders – all the staples of a spine-chilling read. Some of my favourite classic writing is Gothic, but I didn’t relish these tales. They are entirely readable, and they vary in length (some are over five pages, some are just a paragraph) making them easy to dip in to. But I found them disjointed – just as a began to settle into a tale it would end. And whilst they were Gothic, they lacked real art and drama, the qualities I love in Gothic writing (think of the Brontës, think of Heathcliff and the mad woman in the attic… and what a pair they’d make! No one has thought of this before?! *quickly jots down a novel idea). Although not subtly Gothic, these are spooky nonetheless. A Ghastly Story, which this classic takes its name from, is not to be read before bedtime, even by a twenty-something-year-old. This isn’t Aesop’s The Tortoise and the Hare. Incredibly morbid, and I couldn’t really make sense of the point here, other than I understand never to travel to Landau on my own. Another tale, simply entitled ‘A Curious Ghost Story,’ begins in a similarly eerie vein. A gentleman, looking for refuge on a long journey, spends the night in a closed up mansion, rumoured to be occupied by ghosts. Sure enough, he is woken by an apparition, only to realise these ghosts are a group of forgers, taking advantage of the resources the mansion has to offer while the Lord of the Manor is away. The gentleman promises to keep their secret, and does so, receiving parcels of jewellery and new pistols in thanks. I enjoyed this story more than A Secret Beheading and A Ghastly Story. I liked the fact it was a ghost story without ghosts, and the gathering of ‘baddies’ wuss out of murdering the gentleman, instead deciding that showering him with gifts is an appropriate course. These really are a miss mash of stories and I’m not confident why they’re pitched as fables, with Hebel offering us idioms and warnings. I was keen to swap notes with Emma, who read the stories in tandem. We were quaffing drinks at a garden party when the subject arose. She agreed she couldn’t quite settle into them, although she has since lent her copy to a friend who is really enjoying them. Emma made several interesting points, including that they have been translated from German – some of the subtleties that I felt were missing could have been lost. She interestingly pointed out that fairy tales by Hebels contemporaries also strikingly include character that just aren’t particularly pleasant to one another. Inn keepers trying to get one up on the other, murderous couples, dentist con artists. This was an excellent point. Think Rumplestiltskin, wanting first-born children for payment of magic, and Hansel and Gretel being threatened by a cannibalistic witch. These are the realities of European fairy tales before Disney and Pixar adopted them and gave them a glossy finish. Fairy tales, whether for adults or children, are dark and it seems I’ve been living in a rose-tinted, theme park with candy floss clouds and doe-eyed characters. I left with Emma’s comments and, for some reason, Hafez and his eloquent, tragically optimistic poetry tickling my brain. Like Hafez I needed a tipple to lighten the mood. A frighteningly alcohol-dependent statement, I am aware. I visited The Fable, a bar not far from the Monument, London. 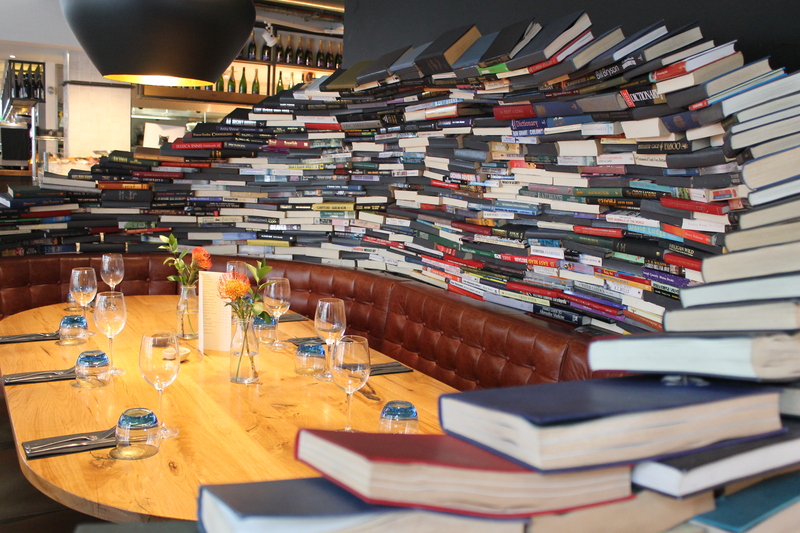 Upon entering this establishment is a table surrounded by a book wall, protecting it’s occupants from cheating villains and deceptive ghouls. I knew I’d just found my new local. Here I had a much needed drink, dubbed an Aperol 1919 (Aperol, gin, rhubarb syrup, apple and prosecco – all the best things). 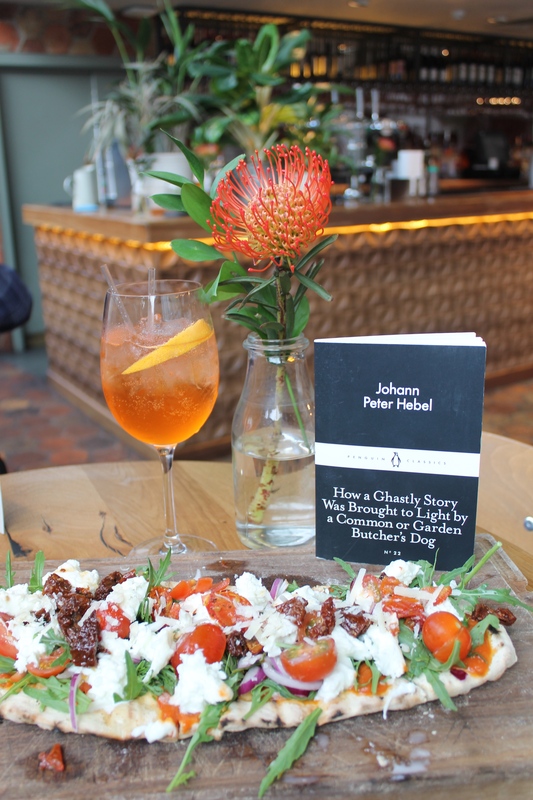 As I sipped on my fruity cocktail, in a Carrie Bradshaw way, I couldn’t help but wonder whether Hebel was just having a bit of a laugh, and possibly poking fun at those stories of a similar ilk. If he was, I’m not confident he passed this off. I’ve felt pulled and tugged by these so-called fables. It would be interesting to read them along side Aesop and the Brothers Grimm, who are both on the list of Little Black Classics. Whatever, musing over the fables with a glass in hand was an excellent way to conclude the journey. Thank you Emma G for choosing this one – I’m pleased we really were reading from the same page! 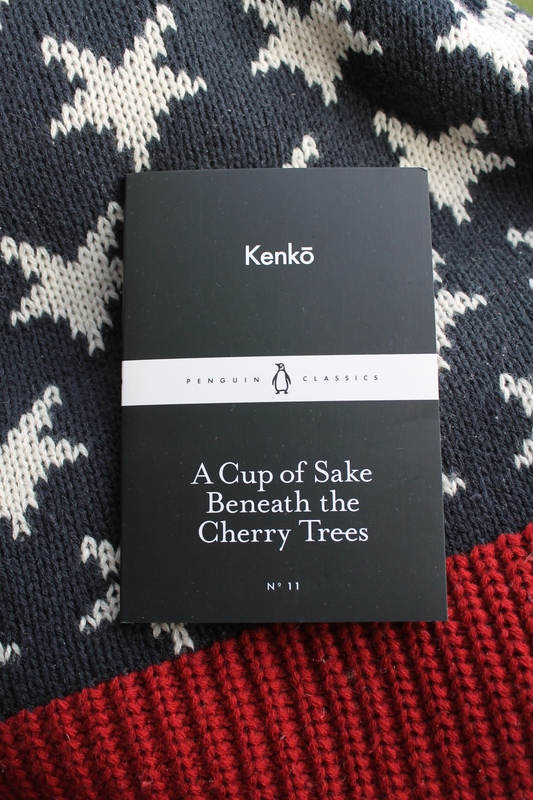 Next week I will be blogging about A Cup of Sake Beneath the Cherry Trees. The jacket states that the collection contains Kafka’s favourite story – do you know which story that would be? Really enjoyed your verdict by the way! Hi Alfie. Thank you! I believe it is the Unexpected Reunion. Let me know what you think of the tale once you’ve had a chance to read it. Oh okay, I would have expected it to be on of the darker ones. I really enjoyed them as little snippets, but I think you have to take them in the context in which they were written to really enjoy them. They pale in comparison of depth to some of the other black classics, but one has to remember that they were just little pieces in a magazine – if you keep that in mind then they’re great! That is a very fair point. They did seem rather disjointed but I can imagine that, at the time, they offered very entertaining reading. They make for great Halloween reading! If you like Gothic, I would also recommend The Old Nurse’s Story – it’s excellent!